At home, we’re no strangers to spice. At any point in time you’d be able to find at least two kinds of hot sauce in our fridge. And if I told you where to look, then you’d also find the third bottle we usually have stashed away in the pantry. You know, as back-up. However, as much as we love hot sauce, we’re also strong believers that it too has a time and a place. Sometimes hot sauce can’t help but overwhelm a dish. When we’re looking for more neutral, delicious but not “focus-only-on-me” spice, that’s where chili garlic oil comes in. We call this “the good stuff”. The oil is quick-steeped with fresh garlic and red chili flakes, and the flavor is absolutely divine. We use this chili garlic oil on basically anything that pairs well with spice and garlic. Which to be frank, is a lot of things. We slather it on pizza, sandwiches, pasta, ramen, roasted vegetables, you name it. This oil is best used immediately, but thankfully it’s easy to whip up in small batches. It takes only five minutes to prepare and you can easily make it at the same time as dinner. Long story short: it’s pretty much magic. The inspiration for this oil came from our favorite pizza shop, which always has bottles of chili oil on the table. It’s a lovely addition, but I almost always find myself craving a bit more flavor beyond the spice. And a bit of texture couldn't hurt. Turns out, garlic brings the chili oil to the next level. Sure you can buy chili garlic oil too, but we much prefer the homemade kind. That way you can leave in the delicious bits of garlic and chili flakes, so that a spoonful of sauce is so much more than straight up oil. So be sure to scoop up some of the yummy garlic and red chili flakes too. It's a serious upgrade if you ask us. Now before you run into the kitchen to whip up a triple batch of this magic oil, let’s talk about garlic - and why this oil is best made in smaller batches. Garlic is a low-acid vegetable, and like all low-acid vegetables, it needs to be handled properly when it comes to canning or storing in oil. The moisture and low-acidity, combined with a low-oxygen environment, can support the growth of toxins. But don’t freak out. You can take the necessary precautions by storing your homemade garlic oil in the fridge, and using it within a couple days. Some food safety sources say you can go up to 4 days in the fridge (or several months in the freezer), but the bottom line is to use it up quick. Which won’t be a problem once you taste how delicious it is! We’ve yet to find a store-bought version that even comes close. That could be because commercial manufacturers are required to process their garlic so it’s shelf stable, or alternatively turn to flavorings to mimic the taste instead. 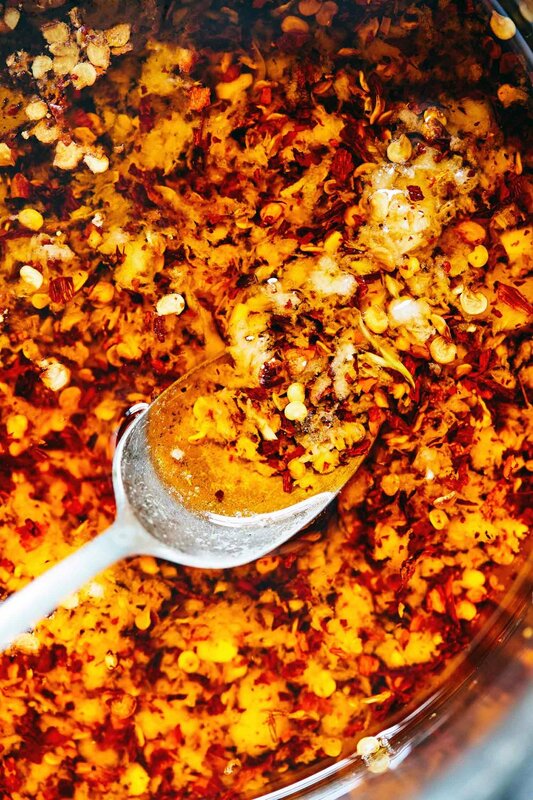 So go ahead and make a batch of this homemade chili garlic oil next time you’re in the kitchen. It makes pizza nights, noodle nights, basically any night’s dinner feel that much more special. The recipe below is for a small batch, so you can use it up quick. Any leftover oil is an easy addition to spice up work lunches and leftovers too. Drizzle it on roasted veggies, grains, rice or anything else that could use a little more pizazz. In a small sauce pot, add oil, red chili flakes, garlic and salt. Turn stove onto the lowest heat setting and let the oil warm gently on the stove for 4-5 minutes. Stir or swirl the pan to prevent garlic from browning. Remove from heat. Transfer contents to a clean jar. To use, scoop up some of the garlic and chili bits (in addition to the oil). Refrigerate extras and use within 2-4 days. -*A neutral oil like grapeseed is preferred over a flavorful oil like olive oil. Neutral oils compete less with the garlic and chili flavor; and are less prone to solidifying in the fridge. If your oil does happen to solidify, bring it out to room temperature and stir until liquid again. -Alternatively, you can skip the fresh garlic and make (garlic-free) chili oil instead. Follow all other steps above. Without the fresh garlic, the oil will have a longer shelf-life. 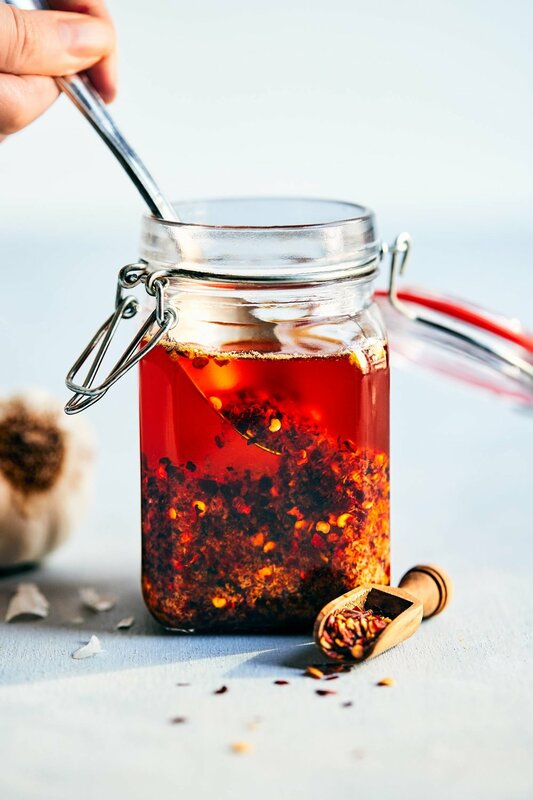 To infuse garlic back in afterwards, you can gently warm the chili oil over the stove and add fresh minced garlic directly before serving.